But now the Blessberg Cave is like a vault without a key -- and no one can get in anymore. In 2008, the cave system was discovered during construction work for a new high-speed rail line from Berlin to Munich. After dynamite was used to advance a tunnel, a crack suddenly appeared. Anxious not to hold up work, the engineers had shotcrete -- a type of concrete conveyed through a hose -- pumped into the hole. Some 500 cubic meters (17,500 cubic feet) of the liquid cement disappeared without a trace. Then work on the project was halted, and geologists from the state's mining office were brought in. 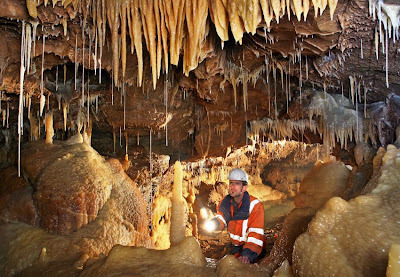 Once the geologists had forced their way through the opening, they suddenly found themselves standing in a cave full of glittering, jewel-like stalactites. Still, the officials felt that further exploration was not advisable for the time being because radioactive radon gas permeates the air in some of the caverns, and even speaking loudly could cause stalactites to come crashing down. It was only the fearless amateur spelunkers from the THV who dared to push forward. Wearing diving equipment and helmet lights, they set out into the cave system. Soon, they were standing in rooms with thousands of "cave noodles," hanging from the ceiling like threads. Seen in bunches, they resemble curtains or harp strings. But the team had no time to marvel at the sight. While the dump trucks waited outside and the demolition experts sat impatiently next to their ignition cables, the speleologists hurriedly mapped out about 1,200 meters (3,900 feet) of passageways, though Seidler believes the grotto is much bigger than what they discovered. A last-minute attempt to secure protection for the labyrinth from nature-conservation officials failed. 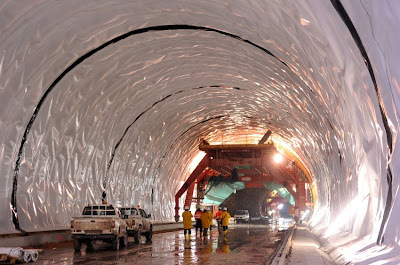 In late January 2009, the caves, lying right next to the ICE tunnel, were plugged with concrete for reasons having to do with structural soundness. But, before doing so, railroad engineers sawed off a few limestone formations -- including a particularly magnificent one dubbed the "wedding cake" -- and took them to a museum. Still, for some people in the region, that wasn't enough. A number of groups are now trying to find a way back into the magical world beneath Blessberg Mountain. 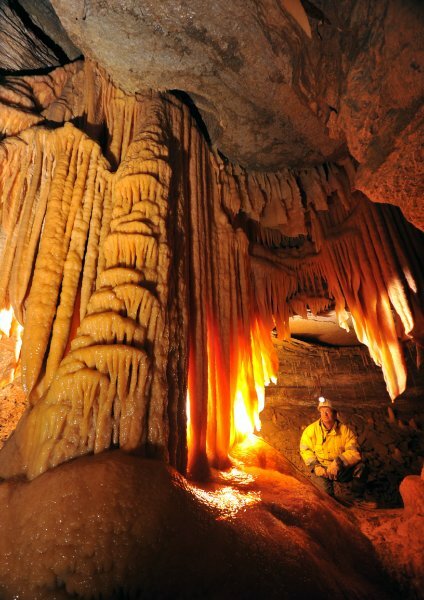 One group wants to turn the cave into a tourist attraction. An alliance of eight towns and two cities wants to market the "discovery of a century." Its plans include "underground viewing windows" and glass hallways attracting "80,000 to 120,000 visitors a year," says spokesman Florian Meusel. More direct access is not possible given the fragility of the karst formations. Thuringia's governor, Christine Lieberknecht, supports the idea -- but only with nice words because the funds for it just aren't there. The THV speleologists, on the other hand, have very clear plans. 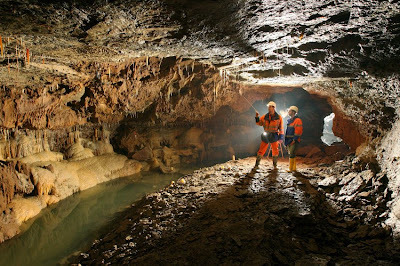 They have sent their scouts to the site several times to search for a natural opening into the Blessberg Cave. "Hidden entrances can be found in places where the soil has collapsed or where there is seepage," Seidler explains. Bats flying out of cracks in the ground are another telltale sign. But the effort has so far proven fruitless. After concluding that the catacomb is completely sealed off from the outside world, the THV now wants to create an artificial entrance for "research purposes." At some points, the rock ceiling above the cave is only 20 meters thick. "We'll use excavators and drills there," says Seidler. Work on the shaft is expected to begin by next spring at the latest. The cave is home to small crabs and other creatures, and it also contains formations called "helictite." Instead of growing vertically, these particularly rare stalactites wind about like worms for reasons still unknown. Meanwhile, the cave researchers are worried that the liquid concrete that flowed into the natural monument might be preventing water from draining out of the underground lakes. The state mining office is currently using a drill probe to test their water levels, and the publication of its preliminary results is scheduled for October. "If we're out of luck," says one official, "the entire cave will be flooded." In 2008, a cave system was discovered in the eastern German state of Thuringia during construction work for a new high-speed rail line from Berlin to Munich. After dynamite was used to advance a tunnel, a crack suddenly appeared. When spraying concrete into the crack failed to fill it, geologists worked their way into it an discovered a massive cave, known now as the Blessberg Cave. The rail tunnel under construction in 2009: Before work recommenced on the tunnel, members of a local cave-exploring association went in to map as much of it as they could. Inside, they found wonderfully colorful formations, including "helicites," which are rare stalactites that grow in inexplicable patterns. A last-minute attempt by the cave association to secure protection for the labyrinth from nature-conservation officials failed. In late January 2009, the caves, lying right next to the ICE tunnel, were plugged with concrete. 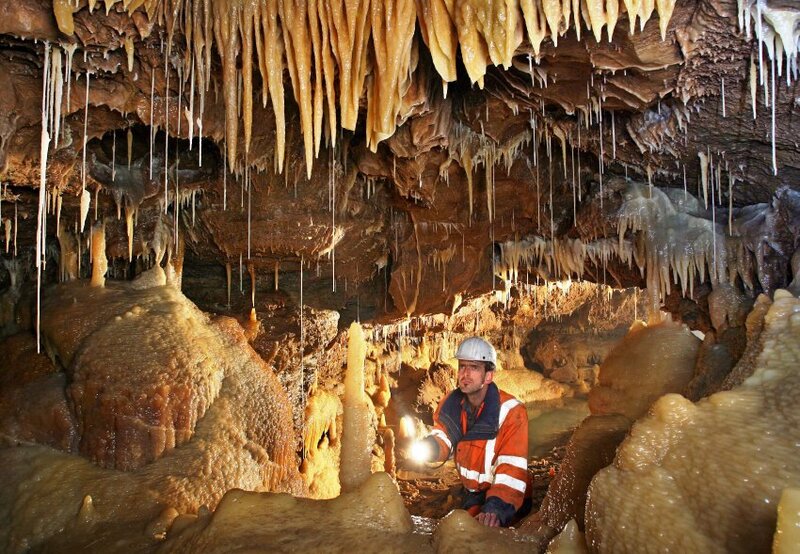 Here, a geologist stands in the cave before it was sealed. The cave association has unsuccessfully tried to find natural openings to the cave. 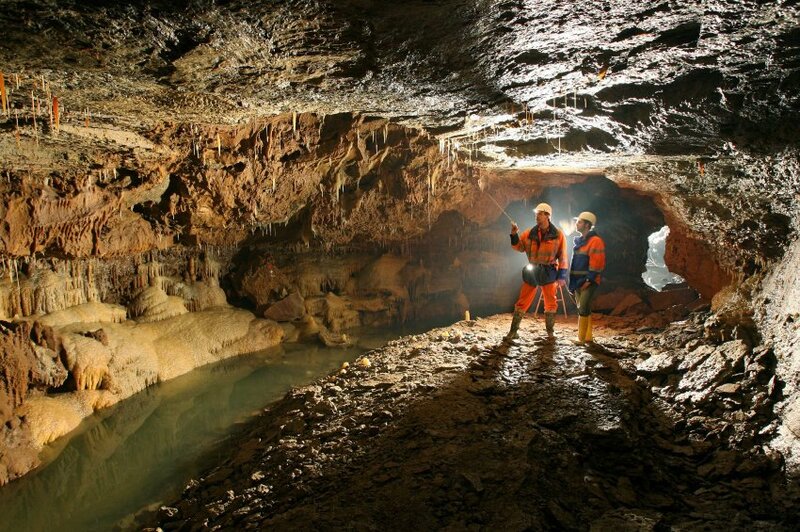 Now they are hoping to use excavators and drills to bore down into the caves and explore it further. Locals have even voiced hopes that the cave can be turned into a tourist attraction complete with "underground viewing windows" and glass-encased walkways.